While reading Michele Finey's brilliant, very well-researched and innovative book The Sacred Dance of Venus and Mars our interest was piqued to find out if the Venus and/or Mars cycles (phases) had any influence on lasting marriages. We wanted to know in the first instance if there was any correlation between the Venus phases on the day of one's marriage and the endurability of the marriage. To find this out we analyzed the marriage dates of the longest marriages ever and compared these with a data-set of marriage dates that ended in divorce. In total, we analyzed 119 dates of these (very) long-lasting marriages. We compared these results with a control group of 175 dates of marriages that ended in divorce after a couple of years. These divorce dates were taken from either the AstroDatabank or the IMDb. In the graph below you can find the comparison between both groups; the green bars represent the long-lasting marriages while the red bars represent the marriage dates ending in divorce (click on the graph below to enlarge it in a new tab). When looking at the green graphs (of lasting marriages) you will notice that 34 out of 119 (lasting) marriages were concluded after Venus reached maximum elongation as a morning star. Another peak is found BEFORE Venus reached its maximum elongation as an evening star. There were no long lasting marriages concluded on a day when Venus went direct nor during the superior conjunction of Venus with the Sun. This may give the impression that when Venus reaches its maximum elongation in the west (as a morning star) a long lasting marriage may result. However, when looking at the red bars of the 175 marriages ending in divorce, the graph peaks between the evening rise of Venus and its greatest eastern elongation on the one hand and between its greatest western elongation and morning set on the other side. This is not a coincidence because there are more than 5-6 months between these moments making for a time frame during which more marriages can be concluded. If you compare this with the couple of days that are in-between the inferior Sun-Venus conjunction and the morning rise of Venus, you will understand why only a few marriages are concluded around the inferior conjunction. It's revealing though that from the 294 marriages analyzed in total, there were no marriages ending in divorce when they were concluded around the inferior conjunction. There is an inferior conjunction when retrograde Venus is conjunct the Sun and maximum 30 degrees earlier than the Sun. It's interesting to note that Venus is retrograde here! While astrologers often proclaim not to marry when Venus is retrograde, this may have to be reconsidered or put into a larger perspective. What can we learn from these preliminary findings? 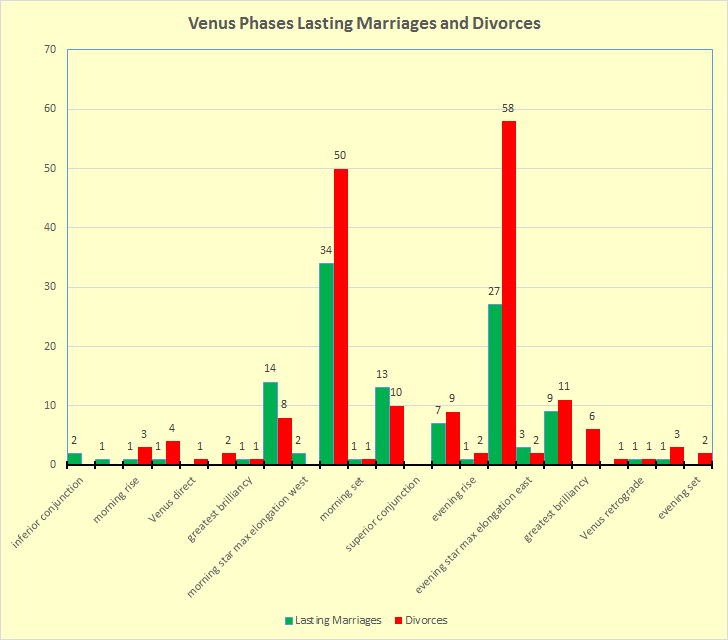 From the Venus phases graphs we learn that lasting marriages and marriages ending in divorce are more or less evenly spread. It's still critical to look at the particular days to find out if some specific aspects or midpoints are found that support a lasting marriage or not. It's the 'quality of the day' that still may predict the outcome of a marriage. Also, some astrologers point out that the Venus-Mars cycle at the time of a marriage may be more revealing. But that's part of another research project. avoid the greatest brilliancy dates! How to get the Venus phases or cycles? If you want to look at the Venus phases or cycles, Astrodienst has a very detailed and most useful list. When Do People Marry Astrologically?